Everyone knows FIBC bulk bags are flexible, it’s in their name. How customizable are FIBCs? The short answer, very. Bulk bags can be designed to exactly fit your storing, filling and discharging needs. We can’t speak for other bulk bag manufacturers, but Conitex Sonoco has more than 300 different skews just in our inventory and 4000-5000 different skews that we’ve quoted. This is great for bulk bag users. You can pick different features and aesthetics based on your equipment and environment with an endless amount of variables. But with this high level of personalization comes the question of quality assurance. Humbly, there are way too many customizable options because all products are different across so many different industries. Making sure all pieces of your made-to-order bag come together to make the highest quality bag possible can be a challenge for your FIBC manufacturer, but it should be a top priority. This blog walks you through how a bag is customized to meet what you need from your FIBC bulk bags from top to bottom, beyond just the bag’s size. There are a few industries that do have standardized packaging, for example, the peanut industry. The American Peanut Council created uniform specifications to help with inventory and quality issues since peanuts are one of the main products the U.S. exports. The peanut industry is definitely the exception. More often than not, a customer will need a customized bag. Let’s start with the outside of the bulk bag. What do you want the bulk bag to look like? What style do you want? The color of the bags can be customized and your logo can be printed on the outside. You have a few FIBC bulk bag material options to choose from as well. Type A - The standard bulk bag material. Perfect for non-flammable products. Type B - Similar to Type As, but prevent sparks from forming. Type C - Used for flammable solvents or when gases are around the bag. Type D - Good with flammable powders and solvents. Unlike the Type C, does not require grounding. Learn more about these types here. You can also pick from different linings and coatings for your bags. 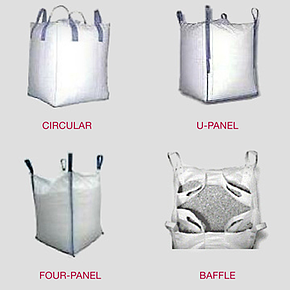 The top of the bag’s design depends on the type of filling equipment you have. Do you fill your bags through a spout? Do you fill your bags through a tube? Do you use a shovel? There’s no wrong answer here. Bag tops can be customized for all of those situations. Do you need to be able to close the top of your bag? Do you want polypropylene webbing, rope or velcro ties? 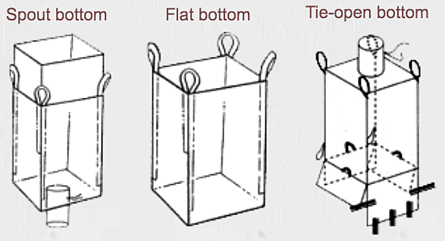 If you don’t want an open bag, look into duffle tops or spout tops. How many loops do you need? What types of loops do you need? Let’s say your filler and discharger are at different heights. You need to have different moderations of loops to accommodate that. Loop design choices include standard four-point, cross corner and single loop. You can also choose from a variety of lift loop options including polypropylene material, multi-filament, fibrillated and a variety of colors. Just like the top, the bottom of the bag has several different customizable options to choose from. They can all address the needs of the customer to best suit their product and process. How will your bulk bags be discharged? Do you need a spout, flat or tie-open bottom? These answers too are based on how your product is handled. If you don’t know, no worries. An engineer can help you out. It’s rare to expect two processes to be the same. Every company and the way they do things is different. Contact one of our engineers if you need help getting the right bulk bag for your exact needs. If you have any questions about your bulk bag needs, let us know! We’re happy to help.